Distinctive Wing Knob-Style Captive Screw Provides Tool-Free Access and Color Differentiation Southco’s new 4C Wing Knob Captive Screw enables quick-access fastening and features an over-molded, distinctively contoured and attractive wing-style head design that can be used to designate access through an array of standard and custom color options. Press-in, flare-in and Surface Mount Technology (SMT) options provide versatility for fastening and unfastening by hand or tool when mounting doors, panels and other hardware components in applications where space is limited. Want to learn more? Use our Contact Form to reach us! Southco, the leader in ATCA access hardware, is the only ATCA supplier to offer a captive screw compliant with the current PCI Industrial Computer Manufacturers Group (PICMG) ATCA R3.0 standard. The ATCA-compliant 47 Captive Screw meets float and material requirements as designated by PICMG. …or use our Contact Form to request more information! We’re here to help. Steeves Agencies carries a wide range of captive fasteners. Why use captive fasteners? They never get lost! Captive fasteners remain attached to your panel or door whether they’re fastened or not, making them ideal for doors or panels that are frequently removed. They offer more choices! 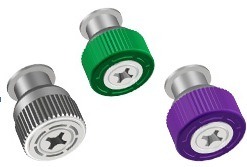 Captive fasteners come in a range of varieties- any thread, any stud length, any installation style (press-in, thread in, snap-in), and now, any COLOR! The nature of the application: Is it outdoors, where it might be exposed to harsh weather or corrosive elements? Ease of use: if finger access is required (no keys or special tools) then you might need a fasteners with a knurled head. Anything’s possible! Here are some examples of fasteners we can supply, all from Southco, the world’s leading manufacturer of access hardware! Call us today for more information.